No one actually knows who the "manneken" (Flemish for "little boy") was and why he is there. Perhaps long ago when most houses didn't have running water, this was just an excentric looking fountain or a decoration on top of a source of clean water. 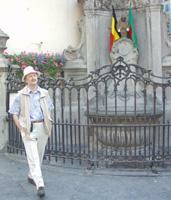 It is known that in the 15th Century there was a fountain called “Manneken-Pis” in the Stoofstraat, Rue de l'Etuve, about a hundred yards from the Grand’Place. The official version, no doubt good enough for historians, claims that on 13 August 1619 a sculptor called Jerome Duquesnoy received a commission from the city for a new bronze statue of a Manneken-Pis to replace an old statue. There are many legends about the Manneken of course. According to one of these, often told by tour guides, a little boy peed like a fire hose and the soldiers of some foreign army seeing this panicked and fled. Now quite a few years ago I myself have won quite a few contests and with gratitude for this rich experience I dare say little boys cannot store enough liquid to pee like a fire hose, let alone intimidate an army with this "weapon". After all, we're not talking here about Greek fire. Where then is this little grain of “truth” present in so many legends ? It is the propensity of our ancestors to poke fun at those foreign invaders. Another legend claims a desperate father promised to put up a statue of his lost son where he was found and in whatever position he was found. According to yet another legend a little boy had peed against the door of a witch who in a rage turned him into a statue. In all those years the little statue has been stolen as a prank by students or by marauding invaders. It has been hidden for protection from foreign bombs. But it has also been quite a tourist attraction. 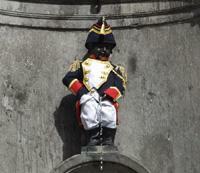 When some first clap eyes on Brussels' Manneken, they are amazed: "He's so little !" some exclaim. What more I wonder do they really want ? The little boy has a wardrobe of more than 1021 costumes. They are kept in the King's House, now the City Museum at the Grand-Place and in the new Manneken Pis Wardrobe inaugurated in February 2017. Officially he received his very first costume on 1 May 1698 from the governor of the Netherlands, then ruled by Austria, on the occasion of the festivities organized by one of the Brussels Corporations. On special occasions and only in the presence of his friends the manneken serves, the best way he knows, real ale of the very highest quality. We don't really consider this a miracle because for one thing we here in Belgium are used to excellent beer. 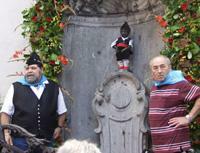 The friends of Manneken-Pis ? Yes of course: the Order of the Friends of Manneken-Pis, de Orde der Vrienden van Manneken-Pis, l’Ordre des Amis de Manneken-Pis. They look after him really well. As soon as you have paid your tribute to Manneken-Pis and while still facing him please look over your left shoulder, down the Rue des Carmes. You should just see some of the spire of the “Eglise du Bon Secour”, the Church of the Good Succor. But I suggest you first climb up in the opposite direction past the Poechenellekelder which we can recommend most highly even if you don't really need a refreshment. But please go have a look inside before you have a "Kriek" outside. A Kriek ? Glad you asked. It's a beer made with cherries. Inside ? What for ? There is a real pocket size theater down there. And now, before or after that drink, please go a few steps further up the hill beyond the Poechenellekelder and look behind you for one of the many strip paintings you may find in Brussels. As soon as you have admired and photographed that, do yourself a favor and go see that church: back down the hill, straight ahead to l'Eglise du Bon Secour (the Church of the Good Succor), one of the many really marvelous churches of Brussels. It’s open every day until 6 p.m. And it won't cost you a penny, if that's what you're worried about. Once inside you will surely agree with me it was well worth the detour. Prayers used to be followed by something refreshing or even a coffee if you prefer, so back you go past Manneken Pis: to the Poechenellekelder ("kelder" means cellar and the word Poechenelle comes from Polchinelle or Pulcinella).&nbps; Yes, there's a real Puppet Theatre down below. In the "Poech" for the "Gewuenders", those who come here often, you have a choice of more than 200 different beers and while you sip your beer you can admire some of the Manneken Pis memorabilia on display here. 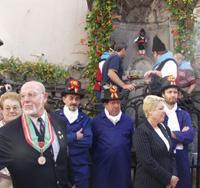 The official website of the Order of the Friends of Manneken Pis is mostly in French but it features a lot of great photographs of recent events.